How do you keep content production on track and hit your publication deadlines? With our editorial calendar template. Manage content in one place. 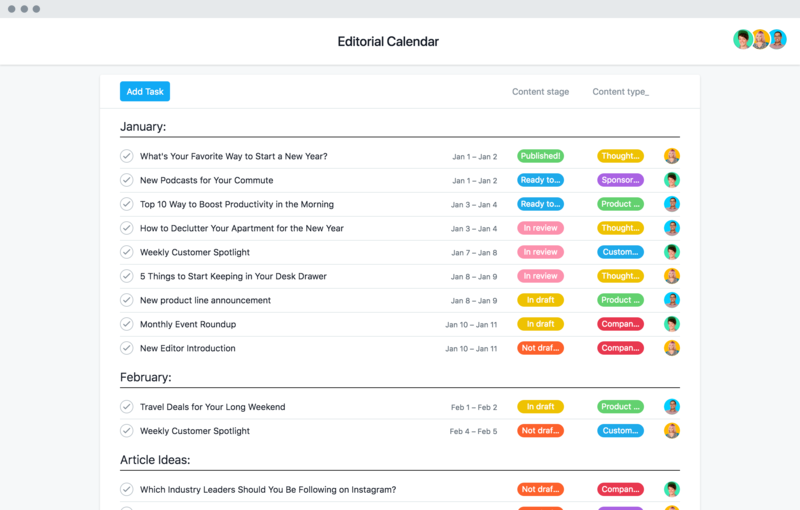 Add every piece of content you’re producing to your editorial calendar project so won’t have to dig through emails, spreadsheets, or docs to know what’s going out when and on what channel. Break down your publication process. Assign tasks for all the steps needed to produce a piece of content—draft, edit, approve, publish—and set deadlines for each to create a workback schedule that you can visualize on a calendar. Make it easy to see content status. When you’re creating a high volume of content, it’s hard to know the status of every single piece. Track content through every production stage so you can see where everything stands. Keep communications and content together. Needs and timing can shift as you’re creating content. Make sure your team has clarity on the latest changes by sharing feedback where work is being done. Planning and executing your content strategy doesn’t have to be a headache with these tips. See Chalkbeat’s secrets for turning ideas into front page news with Asana in action. Scripps makes creating and launching hundreds of videos a month look easy, and they'll show you how. Keeping your social strategy straight across so many platforms is complicated. But not with our tips! Watch our short tutorial video to walk through a simple editorial workflow in Asana. Learn how Redshift by Autodesk has grown content traffic by 30% for three years running. Power up your editorial plans with a free trial of Asana Premium to get features customers like you use.